How Does Mini Skip Hire Work? 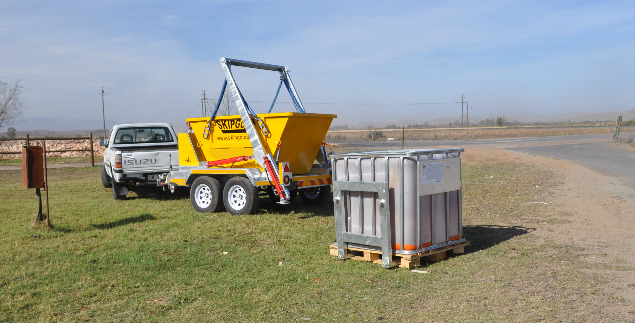 At SkipGo Vaal we provide a professional, reliable and competitively priced skip bin hire service for commercial clients through out the Vaal Triangle metropolitan area. With our bakkies and trailers on the road and lots of skip bins available in varying sizes from 1m³ Pallet sized, 2m³ Mini Skip and 3m³ Mini Skip, our professional staff will supply you with the right sized skip bin for your commercial requirements. We will also arrange the best delivery and pick up times that suit you – its just part of our dedication to excellent customer service. Whether your business in the hospitality, retail, manufacturing or commercial sector, SkipGo Vaal has a waste solution to fit your needs, including Mobile Garbage Bins (Wheelie Bins), Mega Bags, Pallet Bins and Mini Skips. Mobile Garbage Bins (Wheelie Bins) are similar to the plastic bins provided to residents by local councils. They are perfect for businesses with limited space to store bins, or where bins need to be stored internally. Wheelie Bins are available in 260 Litres and can be provided to cater for the following waste streams: General Waste Mixed, Recycling Paper/Cardboard Recycling etc. Pallet Bins or Mega Bags are larger than the wheelie bins and suit customers who generate small to medium waste and have sufficient space to store the bins. They are ideal for hotels, shopping centres, factories, workshops, distribution centres and multiple tenancies sharing waste disposal. Pallet Bins or Mega Bags are available in 1 cubic meter and can be provided for the following waste streams: General Waste Paper/Cardboard Recycling etc. One day’s notice is required when booking commercial skip bins and they can generally be booked out for a period of 7 days. If we are notified before the due date, an extension of time can be considered if affected by inclement weather or other delays.The waste needs of a business can be as unique as the individual business itself. ​Need a bit more than a wheelie bin? A bit too much rubbish or rubble? Can't get big trucks in? In which town and area do you want a skip? How many skips do you require? For approximately how long do you want to hire the skip for?